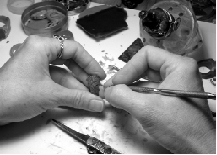 This process starts by shaping the form in wax. This is done by building up surfaces and by carving into them. When the desired shape has been attained, wax wires known as sprues are used to join the form to a cup like base. A cylinder then is placed over the wax form. Next, a special plaster mixture is poured over the form, filling the cylinder. When the plaster has set, the base is removed, and the cylinder containing the plaster encased wax is placed into a kiln. The wax is then melted, leaving behind a void into which molten metal is poured. The metal is allowed to cool somewhat, and then the cylinder is placed into water for further cooling and to help in removing the plaster. Now, if everything has gone right, I have a chunk of metal in the shape I envisioned. Of course I still need to remove the sprues, do some filing, sanding, polishing, and apply any other finishing touches, including the setting of any stones called for by the design. At last, nature’s inspiration has realized in it’s final form, ready for enjoyment by others.